Logan's Pass is the crown jewel of Glacier located off the Going to the Sun Road at an elevation of 6,646 ft. The Going-to-the-Sun Road was completed in 1932 and is a spectacular 52 mile, paved two-lane highway that bisects the park east and west. 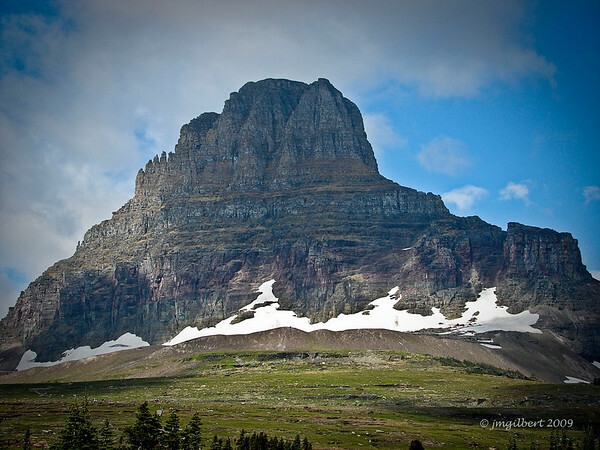 It spans the width of Glacier, crossing the Continental Divide at 6,646-foot-high Logan Pass. It passes through almost every type of terrain in the park, from large glacial lakes and cedar forests in the lower valleys to windswept alpine tundra atop the pass. Scenic viewpoints and pullouts line the road, so motorists can stop for extended views and photo opportunities. In 1983 Going-To-The-Sun Road was included in the National Register of Historic Places and in 1985 was made a National Historic Civil Engineering Landmark. Sony DSC-H2; SV-1/320. AV-f/5.6, ISO-80, 11.4mm.